Aquapalooza - Free Concert Sponsored by SUP ATX! SUP ATX sponsored the historical FREE concert, Aquapalooza which was headlined by Brad Paisley on Lake Travis in Austin, Texas on July 10, 2010. What made this concert so unique was that everyone who wanted to see the concert had to be on or in the water to see it. The front of the stage was on the edge of the lake. 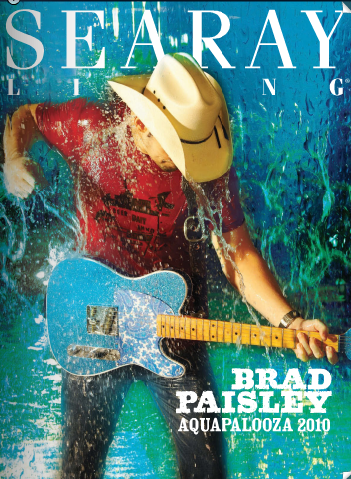 To see the concert, you had to be in or on the water. Over 50,000 people showed up on over 5000 boats. SUP ATX offered free stand up paddle board demos throughout the day. All the Lifeguards at the event were on SUP ATX paddle boards. The SUP ATX Paddle Board Journey from Malibu to Austin was shown on the jumbotron before the concert. Hosting the event this summer is Sail & Ski Center, a leading Sea Ray dealer that was recently ranked as the No. 1 dealer in North America by Boating Industry magazine. 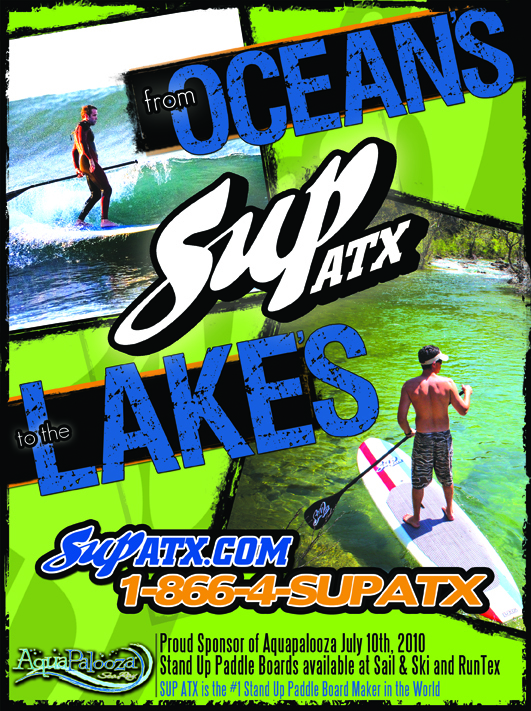 Austin based stand up paddle board maker SUP ATX was a lead sponsor. Check out the images below. It was a truly historic day in the rich music history of Austin, Texas. Everyone who attended will surely remember this day for their lifetime! For the fourth year in a row since its debut in 2006, AquaPalooza broke its own records with an amazing total of approximately 15,600 boats and 84,000 people showing up to share in a grand celebration of the water sports lifestyle. In the past four years, AquaPalooza has more than tripled in size! If you don't already know, AquaPalooza is the name given to a series of on-water celebrations held in July at more than 100 locations around the world. 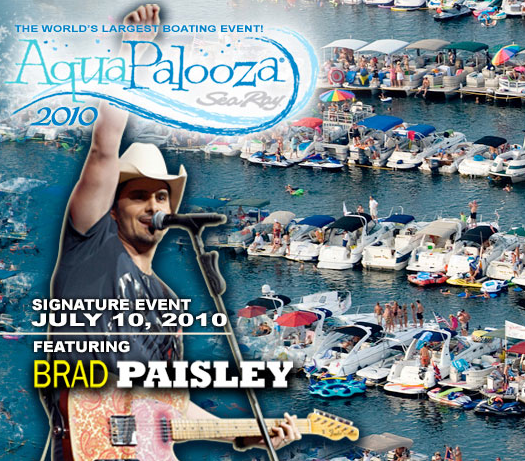 Created by Sea Ray Boats, AquaPalooza is free and open to all boaters and non-boaters. Each gathering features fun activities for family and friends of all ages, such as live entertainment, games, giveaways and much more. 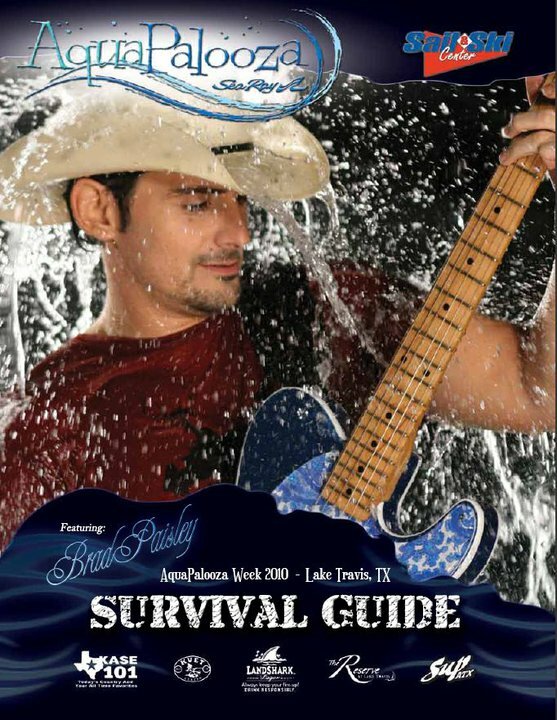 This year's signature event is on Lake Travis in Central Texas on July 10th and features headliner Brad Paisley. Event Sponsors include Landshark Beer (Anheiser Bush), Sail & Ski and SUP ATX.